A petroleum product pipeline vandalisation suspect, Kabiru Akinsanya, has said that his gang usually bribed community leaders whenever they wanted to break any pipeline. Akinsanya, who was discovered to have been in the illicit business for two years, disclosed that his gang usually filled over a hundred 50 litre cans during each operation. He said: “We sell each gallon of 50 litres for N2,000 or N2,500, depending on the demand. So far, we have broken several pipelines around the area. Asked how this was possible, he said: “We usually bribed the community leaders. At times, we give them money or fuel . Kabiru, who was released from Kirikiri prison in 2010, after serving a two-year jail term, said he learnt plumbing when he was there. “ When I was released, I had nothing doing. One of my friends invited me to join them in the pipeline vandalisation business. Since I learnt plumbing in prison, I was useful to them because I used the skill to burst the pipelines and weld them after operation. “We worked together as a group and the rule was that before any job was executed, we would contribute a certain amount of money and give to the leaders of the community. They (community leaders) would not alert the police rather, they would send some young men to keep watch. “But along the line, I left the group and formed another group of four which I was heading. I left the first group because the business was lucrative and I did not want to be under anyone. 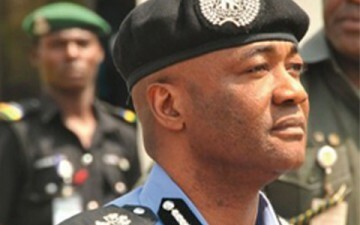 Before his arrest, he said his gang realised at least N200,000 per trip. “But for sometime NNPC stopped pumping and we relaxed. NNPC only started pumping recently and we returned to business. “But the Police succeeded in arresting us because someone who is not a member of my gang broke a pipeline and this caused leakage that attracted the Police. There is no way NNPC would have known that we tapped from their pipeline if there was no leakage,” he stated. Policemen attached to the Special Task Force on Anti-Pipeline Vandalism, Force Headquarters Annex Lagos, arrested the ex-convict who has been on their wanted list, recovering 80 jerrycans filled with petroleum product that was siphoned from a broken pipeline belonging to the Nigerian National Petroleum Corporation, NNPC, in Takwa Bay area of Lagos state. Vanguard gathered that activities of pipeline vandals had been on the rise in Takwa Bay and its environs, following which policemen from the Special Task Force reportedly patrolled the area at night. But Akinsanya’s gang as gathered, succeeded in beating the policemen, as some members of the community were said to keep watch whenever they were carrying out the heinous crime. But the bubble burst, Monday, after some policemen on patrol along the creeks who noticed a burst pipeline, trailed members of the gang to their hide out around the vicinity, where Akinsanya was arrested but other members of his gang escaped. Officer in-charge of the Special Task Force on Pipeline Vandalism , Mr Friday Ibadin, an Assistant Commissioner of Police, said the arrest was made following an intelligence report that vandals had returned to the area.